Happy Easter, everyone! As you know, Easter occurs on the first Sunday after the first full Moon after the Vernal Equinox. So we couldn’t know when to celebrate it without watching the stars. And then, peaking Saturday morning, we have the Lyrid meteor shower! How do we know this, and why are annual showers predictable? As they orbit the Sun, and particularly as they reach the inner solar system, comets are wracked by solar radiation and gravitational forces that cause their ices to melt, gasses to expand, and dust to escape. Comets actually form two tails, one a dusty, icy wake in the path of movement, the second a longer more prominent tail of ionized gas pushed by solar wind directly away from the Sun. Those dust tails don’t just go away. The debris continues to orbit, so that the comet itself occupies a bit of a dirt track, a smear through space, in a known location. As a result, we can predict the passage of the Earth through these dusty regions and know each year that we will see heightened meteor activity as we pass through. The direction we’re travelling through space, from the point of view of a surface dweller near the equator, is toward the eastern horizon at midnight, straight up at dawn. Hence we seem to always see concentrated meteor showers, when we hit these areas, between midnight and dawn – It’s that part of our atmosphere that goes crashing into the clouds of dust and debris, giving us the impression that the meteors are emanating from a spot in the sky somewhere near the eastern horizon at midnight, and towards that same distant constellation at roughly the same time of morning, regardless of where you are on the planet. So it is with the Lyrids, an annual shower that will pelt our atmosphere between April 18 and 25, peaking on the morning of Saturday, April 22. Despite what you may hear, it’s not a discrete event that you can set your watch by. It’s literally the Earth passing through a river of dust, with infrequent encounters on the fringes and a denser peak in the middle. The stream that causes the Lyrids is left by Comet Thatcher (C/1861 G1) which has a period of 415 years, and it’s not a dense stream. Typically the Lyrids only generate 10-20 visible meteors per hour, though some years we encounter denser clouds and see up to 100. The Earth crosses the middle of this stream at about 17:00 Universal Time (or Greenwich Mean Time) on the 22nd, meaning the densest peak should occur at about 1pm Eastern, 10am Pacific. Both are after sunrise, which suggests that the morning before (early Sat) and maybe even the morning after (early Sun) will have good viewing opportunities. Apparent origin point is the constellation Lyra, the Lyre (hence the name). This small constellation is fairly easy to find, and contains bright Vega, the “Summer Star”. One easy way to find it: recall that the star in the kink of the Big Dipper’s handle is actually a double star. If you follow a line from the bright star through its dim companion, you’ll run into Vega, which sits next to a nice parallelogram of stars that form the rest of Lyra. But since we’re talking about meteors here, you don’t really need precision. 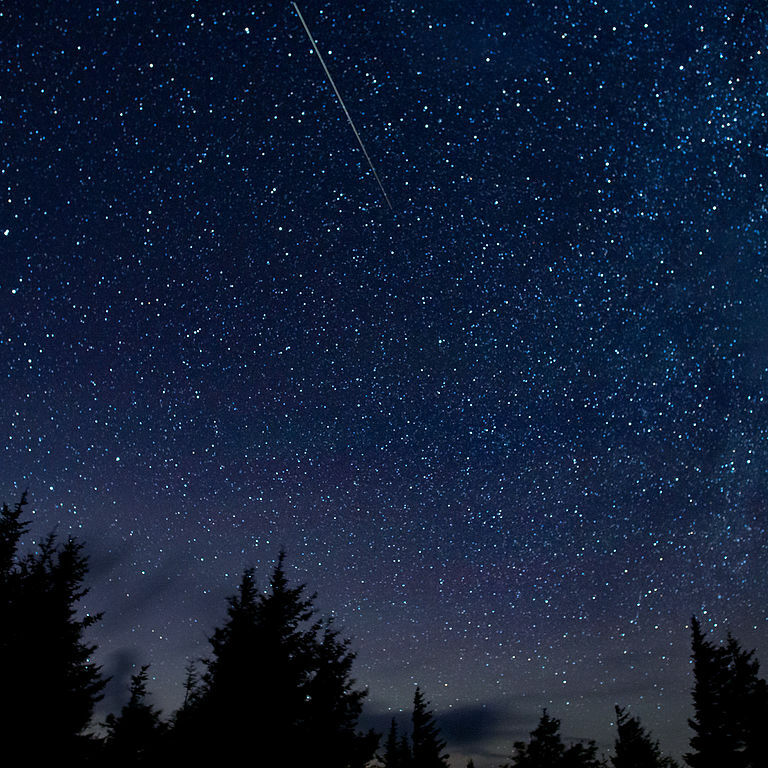 At midnight, most meteors will be coming from the eastern horizon. At dawn, they’ll be coming in from high overhead and appearing to radiate in all directions. Predawn, somewhere in between. Chances to see Lyrid meteors will steadily increase all week, with early morning Sat being your best chance. Find a dark spot to relax and gaze skyward – and enjoy!